Iraqi demonstrators stand in front of Iraqi security forces during an anti-government protest near the government building in Basra, Iraq Dec. 4, 2018. Angry Iraqi lawmakers halted an attempt by Prime Minister Adel Abdul Mahdi to appoint the remainder of his government on Tuesday, disrupting a parliamentary session meant to include a vote on his candidates for key ministries. MPs banged on tables shouting "illegitimate," eventually forcing an end to the session as Abdul Mahdi and his proposed ministers left parliament, one lawmaker said, showing Reuters a video of the session taken on his mobile phone. 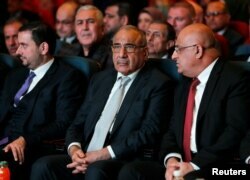 Iraq's Prime Minister Adel Abdul Mahdi, center, attends the opening of Baghdad International Fair, Iraq, Nov. 10, 2018. The MPs were mostly from a grouping led by populist cleric Moqtada al-Sadr and allies on the list of former premier Haider al-Abadi, who opposed his picks for the hotly contested interior and defense ministries. He told journalists he was "waiting for parliament to give a date to complete the cabinet after they come to an agreement," saying that a "state of chaos" had prevented the formation of a government, state TV reported. "We will not present more ministers. Parliament (should) vote on the current list, or another list", state TV quoted the premier as saying. The incident vividly showed the depth of disagreement over who should fill the remaining government posts, and Abdul Mahdi's weak position in the face of divisions between parliament's two strongest groupings. FILE PHOTO: Iraqi lawmakers are seen during the first session of the new Iraqi parliament in Baghdad, Sept. 3, 2018. 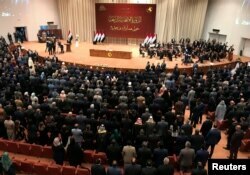 Sadr and Abadi's lists refused to attend the session in response but stormed in halfway through, charging that the session did not have a quorum to take place.